This international neo-Malthusianism conference was organized from 24-27 September 1911 on the occasion of the Internationale Hygiene-Ausstellung (International Hygiene Exhibition) in Dresden. Following on this event the first international Kongress für Mutterschutz und Sexualreform (International conference Protection of Mothers and Sexual Reform) was held, between 28 and 30 September. Rutgers's name appears on participants' lists of both events. 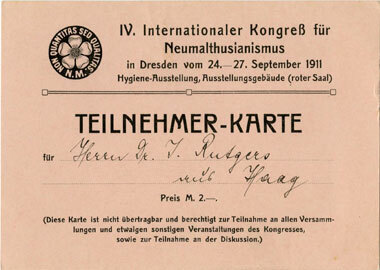 This is his ticket for the NM-conference, where he reported on the situation in the Netherlands and lectured on 'Neumalthusianismus als Vorbedingung der menschlichen Zuchtwahl'.